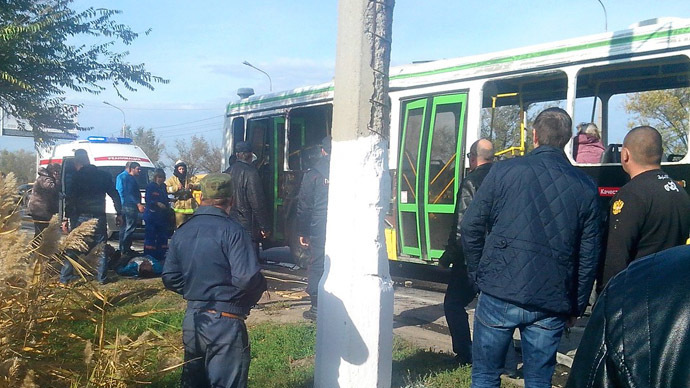 A terrorist attack in the Russian city of Volgograd has killed at least 15 passengers on a trolleybus. The explosion comes just one day after a separate suicide bombing in the city killed 18 people and injured scores of others. Read RT's live updates on the terrorist attacks in Volgograd. 104 people were injured in twin blasts and 33 were killed, according to the Emergencies Ministry. Health officials reported 15 fatalities in Monday morning’s blast, three of whom died in hospital from wounds they sustained. 41 people survived the explosion, with 27 being treated in hospital, according to the latest update. It is feared that the death toll will rise. An infant aged around five to seven months is among the survivors. Doctors are fighting to save the baby’s life, who is in a coma. The identity of the baby has not been established yet. It is feared that its parents were killed in the explosion. There is also a pregnant woman and two 16-year-olds among the survivors. The woman’s life is not in danger. She has been transferred to a prenatal center in Volgograd. The Russia's Foreign Ministry likened the Volgograd bombing to “terrorist attacks” in the US, Syria or elsewhere, organized by groups with the “same motivator”, and vowed not to retreat. “Cynically planned on the eve of New Year celebrations, this strike is another attempt by terrorists to open an internal front, spread panic and chaos, cause inter-religious hatred and conflict in Russian society,” Russia’s Foreign Ministry said in a statement published on its website. The explosion was set off by a suicide bomber and not triggered remotely, spokesman for the Russian Investigative Committee, Vladimir Markin, confirmed. “The investigation believes that the timing and place of the terrorist attack was selected because the trolley bus line is used by many people, including students from nearby colleges,” Markin said. Investigators believe that Monday’s blast and the previous day’s terrorist attack are connected. Both bombs were coated with identical metal fragments, which made the devices more deadly. Investigators said they are questioning blast witnesses and collecting footage from CCTV cameras around the scene. The trolley bus itself was not equipped with a camera, they said. Police are offering witness protection to anyone if needed when offering information on the perpetrators of the terrorist attack. The blast wave was powerful enough to shatter some windows in nearby buildings. The Investigative Committee estimated that the power of the blast was equal to ate least 4 kg of TNT. “I woke up because of an enormous blast I heard. I heard the glass shattering in the first two stories of the building. I looked out of the window, it was still dark, and I saw a bus that was ripped by a blast and people were running away from it screaming,” Alina Averyasova, an eyewitness, told RT. 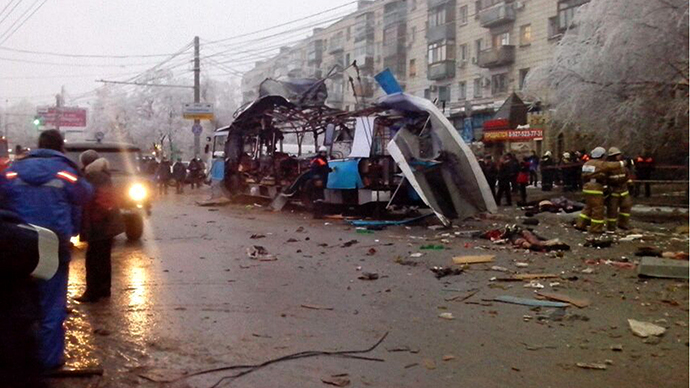 The bus was near one of the city markets when the explosion happened. The site has been cordoned off, with traffic diverted to other streets. Soldiers from a nearby military base and local residents were among the first responders to the disaster, a Volgograd resident told RT. “Young men from our entrance who were at home rushed out. There was much shouting as they and the soldiers were helping,” she said. In a sign of grim irony, the location of the bombing is not far from a hospital, where the victims of Sunday’s attack had been taken. This was fortunate for the survivors of the latest attack, who were able to receive medical attention very quickly. First images from the scene showed a damaged vehicle partially reduced to its metal carcass and dead bodies scattered around. 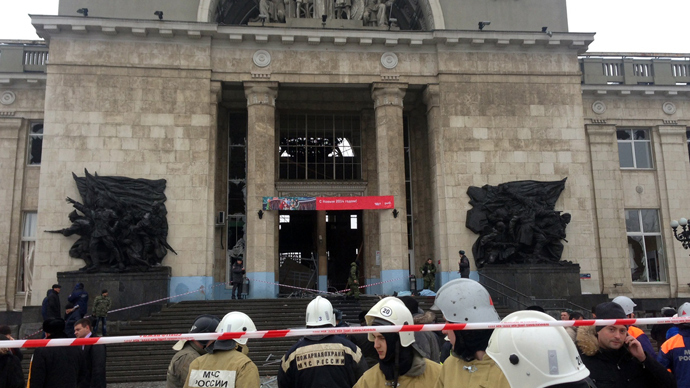 All the people injured by the blast are in serious condition, Health Minister, Veronika Skvortsova, said. “They have burns, multiple traumas, blast-injuries. If needed, they will be airlifted to Moscow,” she told Rossiya24 TV. Overall the survivors of Monday’s blast are in worse condition that those, who survived Sunday’s bombing. The Emergencies Ministry has sent a plane equipped with five medical transportation units. Each of them has four beds and relevant medical equipment needed to fly a patient. The aircraft is also carrying two special ambulances and medical personnel, which will assist with the relief effort in Volgograd. Morale in Volgograd appears to be badly damaged by the terrorism spree the city has experienced. “It’s scary. Everybody left buses and trams and are walking. People won’t use public transport,” a resident told Ria Novosti. Less than an hour after the news of the blast broke, Russian twitter post started spreading reports of a new explosion at a tram station. The rumor was not confirmed. Journalists called on social media to stop spreading panic. The tension is affecting not only common people by also professionals, whose duty is to respond to emergencies. “It’s difficult psychologically. People have been on overdrive since yesterday. There is much grief among the people, among the victims, their families. This takes its toll,” Andrey Akramovsky, chief of an emergency crew involved in the rescue operations told RT. The government of the Volgograd region canceled an all-state-sponsored New Year mass celebration for children on Tuesday, citing security concerns and the lack of appropriateness such rejoicing may have. Many private companies organizing similar events followed the lead. 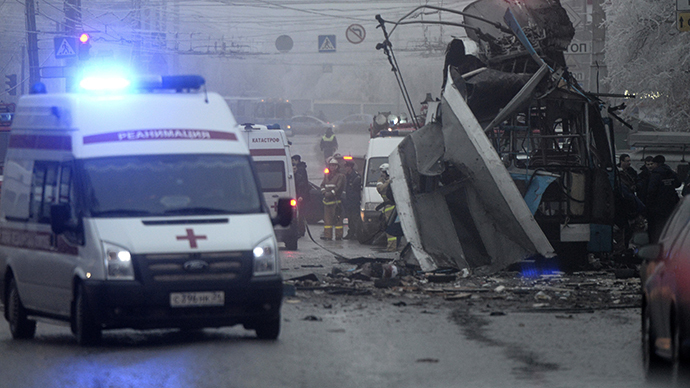 The Volgograd region has declared a period of mourning, starting on Monday for the victims of the two latest bombings. This is a 48 hour extension of the commemoration, which was originally intended to run from Wednesday to Friday. Moscow is beefing up security in the wake of the Volgograd bombings, head of the regional security department of the mayor’s office, Aleksey Mayorov, reported. This comes in addition to increased police presence ahead of the planned New Year celebrations in the city. “We will recheck our focus on the approaches to the sites of mass gatherings, both for pedestrians and for surface and underground transport,” he said. A similar security ramp-up was ordered by the Antiterrorist Committee all across Russia. The new deaths in Volgograd come just a day after a suicide bomber targeted the city’s railway station, killing 14 people on the spot and injuring more than 30 others. Three of those injured succumbed to their wounds in hospital. And in October the city witnessed yet another terrorist attack, when a suicide bomber set off an explosion in a bus heading to Moscow, killing 6 people and injuring almost 40. Despite the terrorist attacks, the Sochi Olympic Games will not require any extra security measures to be taken, the president of Russia’s National Olympic Committee stated. “Everything needed has already been done,” he said. Volgograd was chosen as the target for the series of bombings due to its proximity to the troubled region of North Caucasus, believes Gordon Hahn from the Center of International Strategy. “Suicide bomb attacks are carried out in Russia by mujahidin. It’s very likely that a group affiliated with the ‘Caucasus Emirate’ could be involved and we talked about ethnic Russian suicide bombers, which these organizations try to recruit,” he told RT. The attacks in Volgograd are part of a terrorist campaign to derail the Olympic Games in Sochi, believes Aleksey Popov, former member of the Alpha special forces unit. “Terrorists are trying to spread fear ahead of the Winter Olympics so that people become scared to go to Sochi. No wonder they have chosen the holiday season to make it even more painful for the people and to draw plenty of world attention,” he told RT.